Web-based RFID training helps organizations leverage RFID technology to drive efficiencies. New Enterprise pricing reduces cost of training large, geographically dispersed groups. 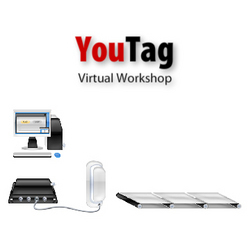 Our YouTag Workshops give you "hands-on" experience with realistic RFID tags and readers, on your PC. RFID Revolution, provider of RFID Essentials, an interactive, Web-based training tool for organizations exploring or adopting radio frequency identification technology, is pleased to announce its new Enterprise License for organizations wanting to familiarize groups of ten or more employees with RFID fundamentals. Companies or government agencies planning to scale up their RFID initiatives can now realize substantial savings when purchasing RFID Essentials for large groups of employees and trading partners. Such groups are usually geographically dispersed and functionally diverse, comprising operations, information technology, finance, and engineering. “RFID technology has the potential to transform industry and commerce by driving operational efficiencies,” said Leslie Downey, Principal and Founder of RFID Revolution. RFID Revolution developed its RFID Essentials Web-based training to enable manufacturers, retailers, hospitals, and government agencies to achieve more successful pilot projects and roll-outs, and think more creatively about how they can use RFID. “Getting the project team members and stakeholders up to speed early in the project helps build consensus and minimize false starts,” said Downey. RFID Essentials has been well received by leading organizations including IBM, Michelin, Northrop Grumman, and the U.S. Air Force. In about eight hours, on their schedule, users acquire a comprehensive understanding of RFID technology; and how to apply it, measure its financial contribution, and systematically plan a pilot. Developed by top experts, this interactive and visual online RFID training includes more than 20 actual applications delivering return on investment--in the supply chain, asset tracking, and other environments. Its exclusive YouTag Virtual Workshops give users the equivalent of hands-on experience with realistic RFID tags and readers, on their PC. Two real-world case studies challenge users to think through how to evaluate alternative RFID investments. The RFID Essentials Enterprise License features a fixed fee for a full year of course access for a group of ten, 75, or 300 users, and larger groups. The effective price per user reflects a substantial discount from RFID Revolution’s individual subscription price of $595. For example, a $15,000 fee purchases access for 75 users, representing a 66% discount. Goodyear and the U.S. Transportation Command (USTRANSCOM) are taking advantage of the new Enterprise License to train many more people and accelerate their RFID initiatives. USTRANSCOM is working to achieve full visibility of the supply chain it manages for the U.S. Department of Defense. Goodyear purchased its Enterprise License from AIAG, RFID Revolution’s distributor in the automotive marketplace. Many of AIAG’s members have used RFID in the manufacturing process for years and are now evaluating the technology for inter-company applications like tracking returnable containers. AIAG is promoting the development of standards for industry-wide use of such applications. Vienna, Virginia-based XIO Strategies offers RFID Essentials to the U.S. Department of Defense and civilian branches of the U.S. Federal Government as part of its supply chain consulting services. The company will soon be offering the new Enterprise pricing on its GSA schedule. For more information, contact RFID Revolution, at +1.301.589.9791, or visit our website at http://www.rfidrevolution.com. Based in the Washington, D.C. area, RFID Revolution LLC provides radio frequency identification training and market strategy consulting services. Its leading-edge, Web-based training, RFID Essentials, provides professionals in end-user organizations with comprehensive working knowledge quickly and conveniently, so they can advance their organization’s RFID initiatives and accelerate return on investment. Its market strategy consulting services are aimed at helping companies with emerging RFID solutions drive revenue growth. The company co-founded and administered the first RFID industry awards event in North America, the RFID Excellence in Business Awards, at RFID World 2007, and sponsored and administered the second Awards event, in 2008. RFID Revolution will feature its RFID Essentials Web-based training at the Air Force AIT/IUID Warfighter Conference, on July 27 and 28, in St. Louis, Missouri.